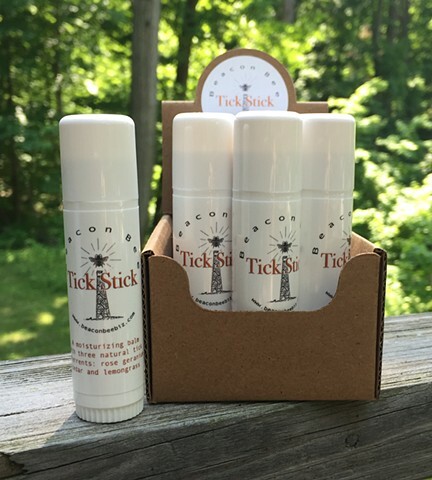 Our natural, beeswaxbased Tick Stick contains three essential oils known to deter ticks: Cedar, rose geranium (pelargonium capitatum x radens), and lemongrass. With traces of honey, royal jelly and propolis, our Tick Stick not only helps keep ticks away, but it also protects, heals and nourishes your skin. For best results, apply every three hours to exposed skin. Ingredients: shea butter, almond oil, beeswax (including wax from our hives), vitamin e oil, essential oils.